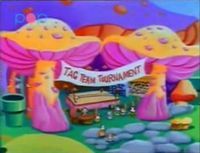 The Tag Team Wrestling Tournament is a wrestling event hosted by the Mushroom Wrestling Federation at an arena in the Mushroom Kingdom. It takes place during The Adventures of Super Mario Bros. 3 episode "Tag Team Trouble". The tournament has a one-million Gold Coin grand prize, which Bowser and Cheatsy Koopa want to win. Toad, under the belief that Bowser has stolen a one-million Gold Coin donation from him that he is supposed to give to the Mushroom Kingdom Orphanage, sees a flier advertising the grand prize. Toad initially recruits his cousins, The Mushroom Marauder and Jake "The Crusher" Fungi to enter the tournament for him. Although their future opponents, the Sledge Brothers, knock them over by creating a tremor when they went to sign up, the Mushroom Marauder and Jake roll into them, proving that they are a shoo-in to win the match. However, Cheatsy succeeds in hypnotizing Toad's cousins, and they are unable to wake up in time for the match. Not knowing who else to turn to, Mario and Luigi agree to fill in for Toad's cousins, as the "Masked Mashers of Mayhem". After a long workout, they are ready for the match. At the tournament, Cheatsy resorts to cheating to help the Sledge Brothers win the match. First, Cheatsy rings the bell early, allowing one of the Sledge Brothers to hit Mario. Cheatsy then tugs on the cables on the side of the ring to knock Mario out of the ring, and into Bowser's lap. Luigi attempts to fight one of the Sledge Brothers, but he triggers a hole in the ring that Cheatsy set up, and Luigi falls in. One of the Sledge Brothers then squirts Mario and Luigi with some weird goop from one of Cheatsy's traps, and they prepare to crush the Marios. Princess Toadstool, fed up with all the cheating, runs out of the arena and returns with two Starmen, which Mario and Luigi use to defeat the Sledge Brothers just before they can be announced the winners, as well as Bowser and Cheatsy. The Mushroom Referee is about to award Mario and Luigi with the prize money, but Toad takes it, and runs off to the orphanage, unaware of the fact that he had already donated money. This page was last edited on August 17, 2018, at 16:31.